As February slips into March, the warm-hearted booksellers of our Shelf Talkers panel have some picks to see you through to spring. In award-winning author Timothy Taylor’s new novel The Rule of Stephens, Taylor asks the question, are you living in the rational world of Stephen Hawking or the darker, unbalanced world of Stephen King? When Catherine Bach walks away from the crash of AF801, from which there should have been no survivors, her life is forever changed, but whose rules is she living under now? A literary thriller of the highest order! Love, like families, comes in all shapes and sizes. 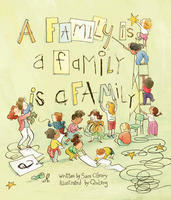 This brilliant picture book showcases families in all forms through the eyes of the children who love their differences. A Family Is a Family Is a Family is the perfect book to open a conversation, celebrate our originality and feel warm and fuzzy inside. I love this book as much as I love my crazy family. This is a beautiful yet heartbreaking book about family and love. A tragedy drives Ben and Maggie far apart as they attempt to live after unimaginable loss. Ben is institutionalized after a possible suicide attempt and Maggie is frozen with grief. How can they heal their wounds? Billie Livingston has written another excellent novel that showcases strong yet flawed characters who you can't help but love. Read this one and then read all her other novels, you won't be disappointed. A few weeks before Matt Cohen's death in 1999 he won the Governor General's Award for Elizabeth and After. Long one of my most favourite books, it weaves two love stories and spans two generations in small-town Ontario. The writing is deft and brilliant and authentic. Elizabeth has stayed with me for many years. One of the many things Biblioasis does well is the occasional reissue of books that never should have gone out of print. Enter Terry Griggs, and The Iconoclast's Journal. First issued by Random House as Rogue's Wedding about fifteen years back, the novel now has a home worthy of it. It's fitting that the book drops in May, as it's said that in the spring a young man’s thoughts turn to love. In the case of Griffith Smolders, however, he's getting ready to fulfill his conjugal duties in Victorian-era Southwestern Ontario when the apparently nervous fellow is shocked by a mysterious ball of white light that bolts through his room. Grif, of course, panics and flees. Avice, a severely angered bride intent on vengeance, gives chase as Grif does his very best to keep a step ahead, essentially traversing the perimeter of the Great Lakes.